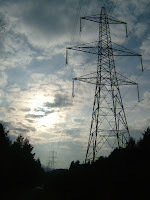 If you want to ride your bike around Stover Country Park near Newton Abbot you are relegated to a track which runs alongside the A38 Devon Expressway and which is lined by pylons which buzz above your head. Not exactly a rural idylll. 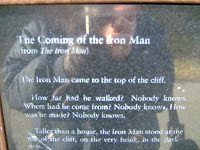 Despite that, they include this on their Ted Hughes Poetry Trail, appropriately enough, with a section from The Iron Man. It works rather well. Today it felt like Spring. The sun was deliciously warm, and up on the Moor it was quiet and still. We walked along Dr Blackall's Drive, which was created in the 19th century by the local Lord of the Manor, so he had somewhere he could drive his carriage and take in the spectacular views of the Dart gorge. 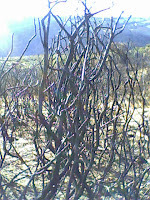 We came across stark skeletons of blackened gorse over quite a large area. This is the result of swaling, a historic local practice in which controlled burning is carried out to check the spread of the gorse. The smell of scorched wood in the sun was quite intoxicating. As the snow started to melt, the rain started to fall, and there was water everywhere. 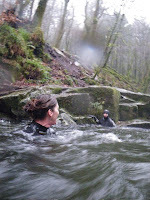 So what better than to get down and dirty with it in the churning depths of the River Erme? We trudged off along the road and through the woods feeling ever so slightly silly in our wetsuits, but in fact they were the most sensible things to be wearing, given the amount of rain. The river was totally alive. Waterfalls had appeared out of nowhere and were thundering into the pools. The river was tumbling over itself in its race onwards. We swam in one of the larger pools, which is normally tranquil. Not today. Although blizzard conditions unfortunately resulted in two hundred people being trapped in their cars in Devon overnight, it also meant we could stay at home and take advantage of the snow. We grabbed our surfboards and headed out the Terrace, a steep hill in Ashburton. Lots of others had the same idea, and there were shrieks and whoops as people whizzed down, with frequent emergency stops in the hedge at the bottom. Who needs a sledge when you've got surfboards? 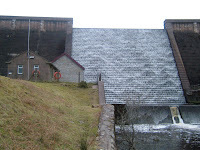 As icy winds blew in from Russia, ahead of predicted snow, we walked up to the Avon Dam. It felt as though we were behind the iron curtain in the cold war era. A monolithic structure; a vast wall of water; a strange little hut to the side with a sign warning us to keep out. Grey and grim.